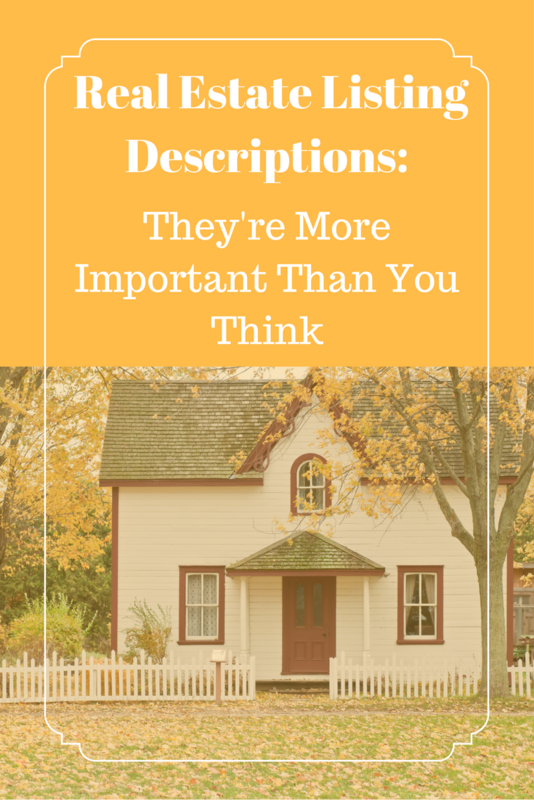 With more and more people using the internet to find homes, your written descriptions are becoming more important than ever. When it comes to listing a home online, I find that many realtors put most of their effort into the pictures, which is an understandable mistake. “A picture is worth a thousand words,” as the saying goes. However, images, and even video tours, can only tell your potential buyers what is currently there. Your listing has the opportunity to do what pictures can’t: tell your potential buyers about the type of life they can live there. Typically, a written listing is intended to do one thing: list features. Just think, an aspiring homeowner comes across your listing online. They look at the pictures, and see that the house is nice, but there isn’t much making it stand out. Maybe there’s even something they don’t like about it, such as the kitchen appliances or wallpaper in the bedroom. Of course, those are things that are easy to change, but in a picture, you’re not given the opportunity to see what that space could become. The buyer scrolls down to the written listing to see only a bullet-list of standard features, and while doing so, is distracted by the promoted homes on the sidebar of the site, which tempts him to click away. Imagine if, instead, your listing had given them a story that could hold their attentions–one in which the buyer could insert himself as the “protagonist,” and read about what his life could be like living in this home. A well-written listing with an evocative and attention-grabbing headline is a powerful marketing tool, because unlike pictures, they’re versatile, and provide endless possibilities. Set far off the road and surrounded by forest, this home is the perfect environment for anyone seeking peace and quiet. With a four-car garage, in-ground pool, and nearly two acres of fenced-in property, any family could easily make a home here. The immense back yard is a wonderful place to host summer recreations, and the large back deck would be a lovely place to lounge during summer evenings. Pet owners might find the quarter acre kennel a great addition, or, the fenced-off area could serve as a garden. The most recent addition to the home is a three-season room, which connects the kitchen to the garage. This beautiful room was designed to be a relaxing space, with wood paneling and big windows on the east and west walls that let in plenty of light. For inquiries, or to request a visit to ______________, please contact _____. With those three paragraphs, not only did I inform you about the special features of the home that might be attractive to a potential buyer, but I told the buyer a story about the ways in which he could potentially use these spaces. Such descriptions are more than just fancy words–they invoke in the client images about how his family would fit in such a space. The descriptions don’t need to long, either. Many MLS systems have strict description limits, but you can still use your available space to tell a story. Large, 5-bedroom home located far off the main road. Two full baths, with one part of the master suite. Recently-installed wood floors throughout the living room and hall way. A beautiful three-season room connects the kitchen to the large, four car garage. The house has a large back yard with in-ground pool and a volleyball court. This listing tells buyers very little about the home that isn’t more easily accessible in a bullet list. Also note the style inconsistencies and repetitive, unenthusiastic language. The header provides little information about the property that would distinguish it from other homes. You should be using every resource you have to sell a home, and there’s no reason not to use your listing’s description to its full potential. It might seem like a lot of work, but when you’re selling a home online, there are a lot of distractions. Don’t let your listing get swallowed up by the competition. A little work invested in your listing descriptions can reduce the amount of time a house is on the market. Previous postCheck Out My Article On Glens Falls Pet Fest!